A good friend texted me around the end of the year inquiring about an anniversary gift for her husband. 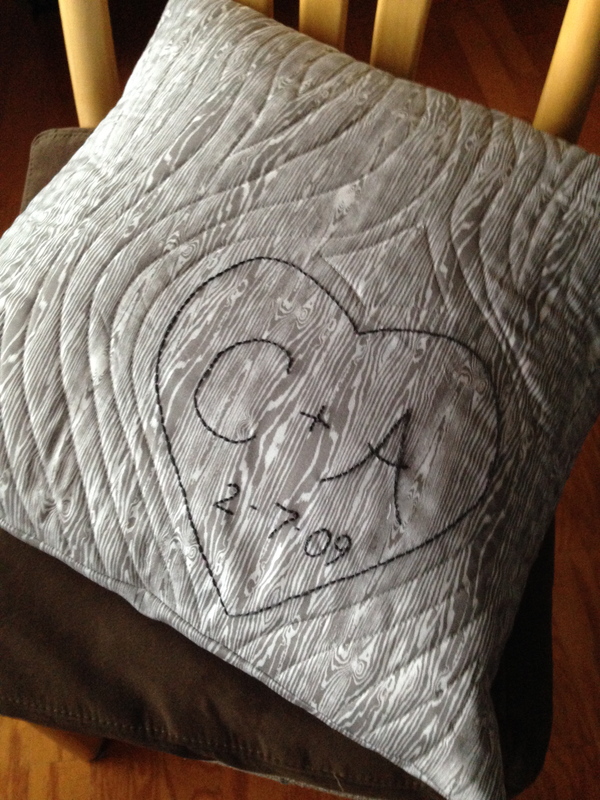 The traditional fifth anniversary gift is wood, and she had seen a quilt that was a sweet homage to that. We decided to do a pillow version, and I was excited to get to work. This year, I have been seeking out projects that challenge me, so for this one I took my first stab at embroidery. Oh. Em. Gee that was fun. It was addicting and so fast compared to bigger projects. I found myself wishing I had different colors of floss and started dreaming up embroidered projects all over the place. I only know one stitch, but a girl can learn. That’s what the whole process is about, eh? The fabric is a gray wood grain from Joel Dewberry, which goes beautifully in my friend’s impeccably designed living room (if I do say so myself). I off-set the embroidery because I’ve always been a fan of asymmetry. 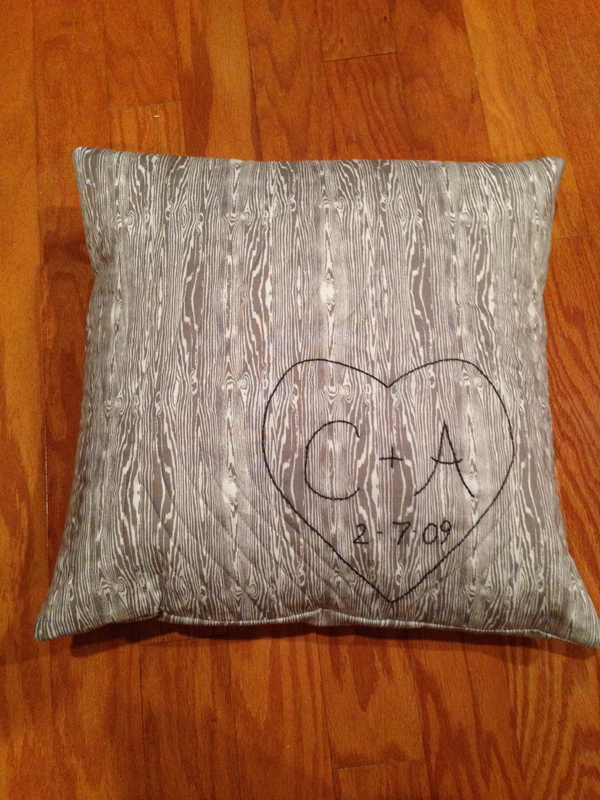 I quilted some texture into it, but used an off-white thread so that the fabric could do its thing. I didn’t want it to be too busy. 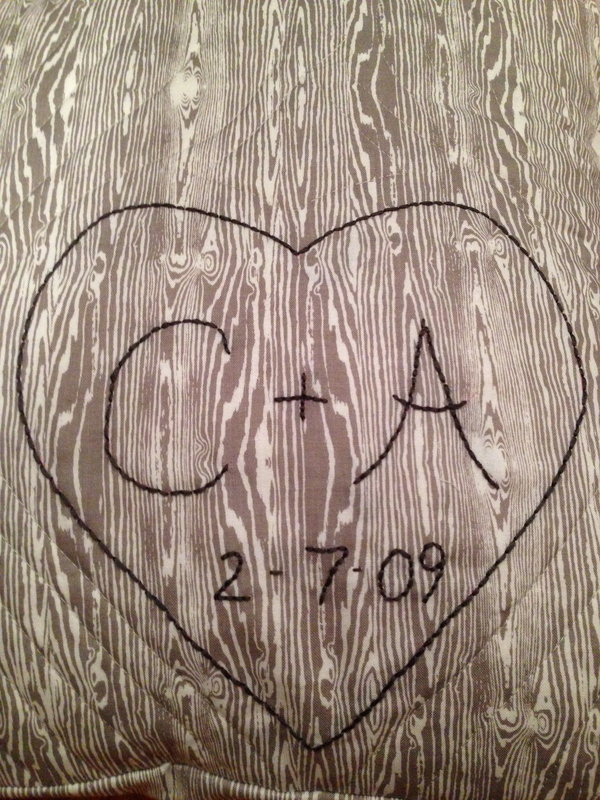 Happy anniversary Allison and Craig! I like how it turns out as a pillow! I’ve made a few minis for wedding or anniversary gifts that were inspired by the same quilt, but have yet to try embroidery or a pillow for them! Oh wow, thanks! What a great resource!